Anyway, I'm sure that, by now, you are completely aware of how obsessive and compulsive I can get when I unearth a new gem (i.e. brand). And this trait of mine is multiplied a million times when that brand happens to hold a sale of some sorts (I'm not very proud of this. *nods solemnly*). So... When I learnt that VMV Hypoallergenics was having some delicious sale on that 'fateful' Friday, all the I-will-only-buy-what-I-need-and-avoid-all-temptations caution was thrown to the wind and I hopped over to the website and proceeded to spend a good 3 hours there, prowling like a starving wolf. This is one of the many star products of VMV Hypoallergenics. It mattifies and kill acne AND sweat acne with its skin-safe and coconut-derived ingredient, Monoglyceride. 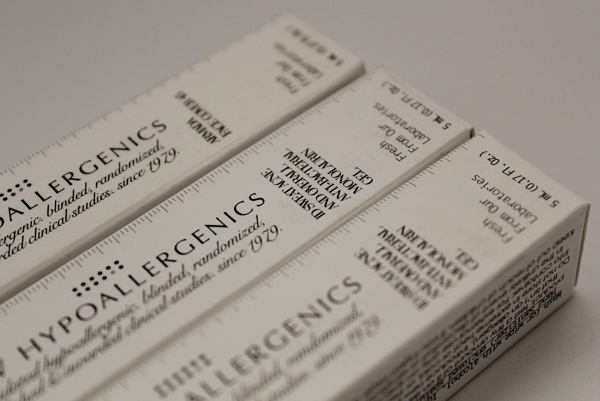 What really got my eyes widening is the fact that this gel also addresses acne that is caused by the sweat fungus. 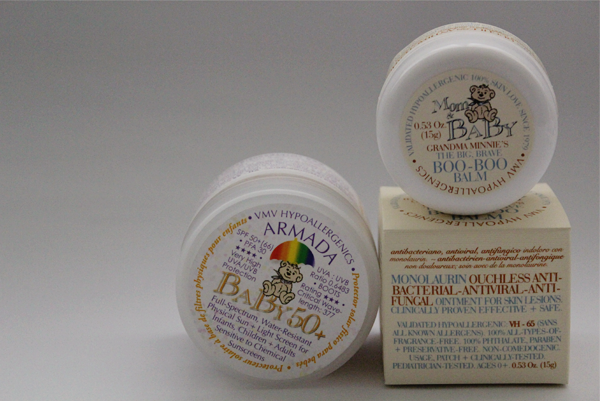 Overall, this is, quote, an impressive overall, broad-spectrum topical anti-bacterial, anti-viral, anti-fungal, and anti-protozoal treatment. Pretty amazing, aye? I have started using my sample of this and gee, I'm really falling in love! 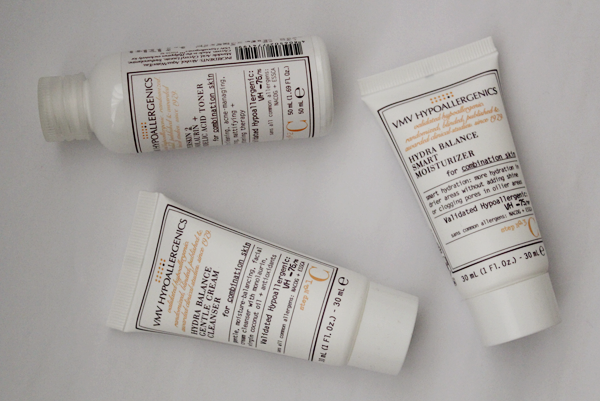 The next 3 little ones provide a summary of the Hydra Balance Regimen for Combination Skin. This simple regimen 'enhances your combination skin's moisture balance, providing richer hydration or shine reduction where needed'. 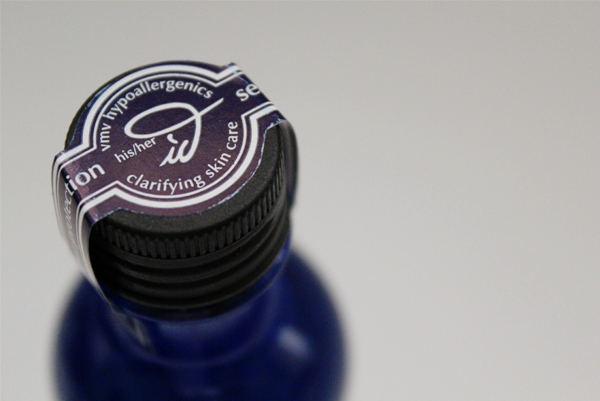 It also 'effectively targets occasional acne, dryness and hypersensitivity'. 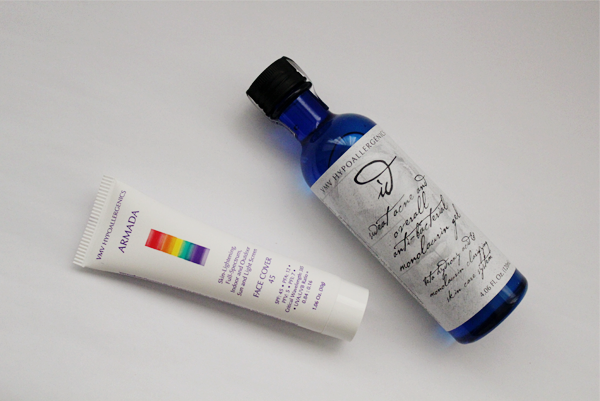 The cleanser and moisturizer were featured in October's Vanity Trove (Click here to read.). Another star product, this is for those who aren't exactly sun-loving and just need a medium-weight cream to protect them from any infiltrating evil rays. This little tube may look nondescript but man, it gives you the most comprehensive protection against melasma, sun-induced skin cancer, photo-aging, and other photo-induced damage; indoor and outdoor UVA, UVB, Infrared and Visible Light, it's going to be your superhero. This little round tub is a pure physical (Inorganic.) 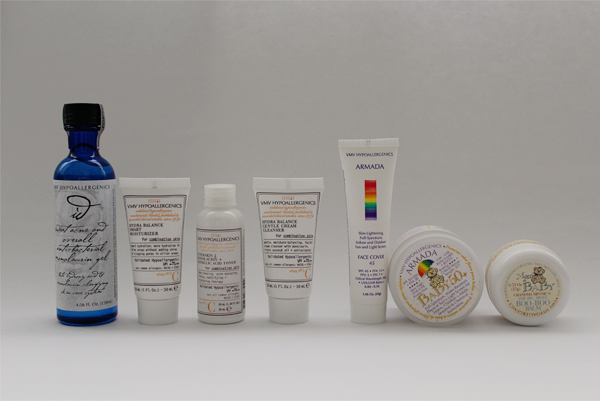 sunscreen of coconut-derived Monolaurin (Anti-bacterial.) and Green Tea (Antioxidants.). 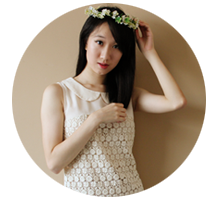 Again, it provides protection against UVA, UVB, Infrared + Visible Light from the sun as well as indoor light + heat sources. Free from PABA, phthalates, parabens, preservatives, dyes, allergens, fragrances, this is perfect for our little ones and for those with hypersensitive skins. This is a tub that contains Monolaurin for ouch-less antibacterial treatment of skin woes, such as eczema, dermatitis, psoriasis, herpes, wounds, cuts, grazes, insect bites, minor burns etc. I got this because lately, I have been getting lots of little grazes with unknown origins. 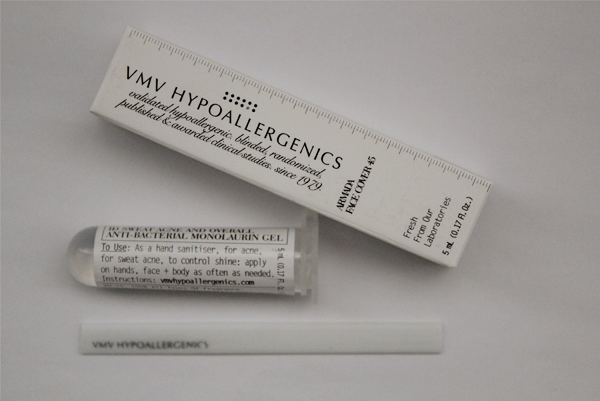 This is actually the first item that I wanted to get from VMV Hypoallergenics. 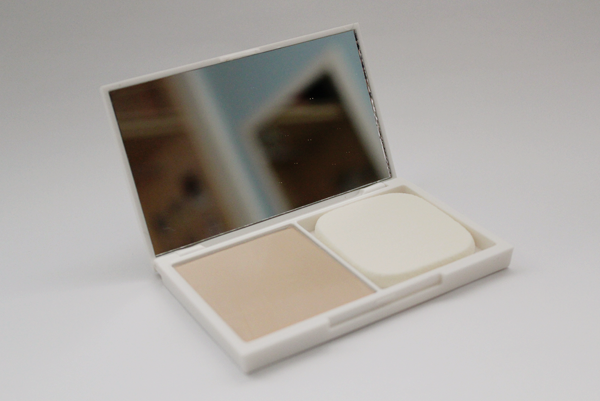 Unfortunately, this hasn't made its way to Singapore yet so I got the Illuminants Brilliant Finish (SPF) 25 Powder Foundation instead (Click here to read my first impression of it.). While I'm enjoying the latter, one never forgets her first love so this was the first item that I added to my cart (And did not remove throughout the 3-hour hem-ing and haw-ing.). I'm a little sad that this doesn't contain any SPF but I have the Armada Face Cover 45 to make up for that. So yay! I can't wait to use this! And here ends my not-so-humble haul from VMV Hypoallergenics. 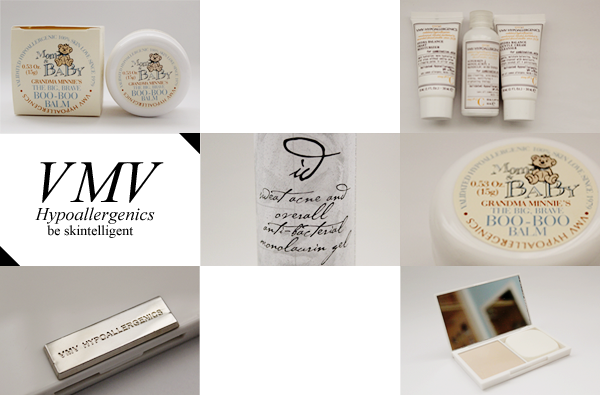 Shopping at online VMV Hypoallergenics was an absolute joy with the easy-to-navigate site layout and fuss-free transaction. 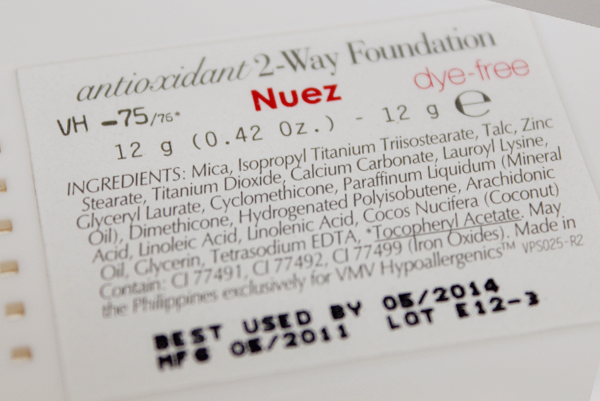 Karen (@KarenAtVMV) was a real help in matching my shade for the Antioxidant 2-Way Powder Foundation and then later on, getting the item into my cart (Thanks again! ).